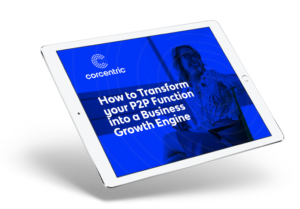 A new Corcentric guide uncovers the business intelligence that’s hiding in plain sight in your B2B payment data. There are three factors that have transformed B2B transaction processing, turning traditionally back-office functionaries into strategic players: visibility, transparency, and analytics. This is true for each step in the P2P process; however, rather than looking at each step individually, companies should adopt a holistic approach where data is available from the point where a PO is issued to the endpoint where an invoice has been paid. And all of this has been made possible with the development and implementation of advanced cloud-based financial process automation solutions. Although many companies have digitized and automated varying steps in the P2P cycle, the “last mile” in the P2P process, payments, still remains largely a manual and paper-based undertaking. As automation streamlines the procurement and AP processes, removing inefficiencies and enhancing accuracy, it will do the same when applied to the actual payment function. But greater efficiency and accuracy, although beneficial to the bottom line, will not necessarily give finance the information necessary to better manage their spend and cash flow. That will come from analyzing the data that already exists within the system. It’s time to find the treasure hiding in your B2B payment data. Download the guide now.